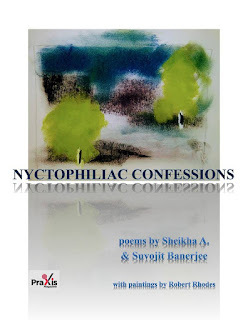 Nyctophiliac Confessions, penned by Sheikha A. and Suvojit Banerjee, published by Praxis Magazine Online, embellished by abstract paintings of Robert Rhodes, an artist- poet, is an intricately woven chapbook, clever, subtle and so very engaging. Many of the images used in the book, are from Rhodes' “Night Etudes” series. The exquisite cover of the book is also a painting by Robert Rhodes. I believe, half the poets in this world love the nights, and pen most of their thoughts during the night. I am happy that the bouts of insomnia of these poets, have gifted the world some exquisite poems, multi- layered and thought provoking. The introduction of this book, where the two poets have contributed fifteen poems each, has been written by Tariro Ndoro, a Zimbabwean storyteller and associate editor of fiction at Praxis magazine online, and it packs a powerful insight into the poets’ writing style. I have always been in awe of Sheikha A.’s poetry, the immense power of which, has often left me dumbfounded. In this collection, we find her lingering on the contours of the night, sometimes also catching hold of the night by the scruff of its neck, and conversing with it in a charming camaraderie. The heart stirs, the mind opens up and images are created and recreated. We hear the ripples of muted echoes and hey presto! In the dark of the night, poems are born- seductive, breathtaking and extraordinary. Each poem has many concentric circles which you keep peeling, and with each peeling, you find some new meanings, some hidden nuances, some more profound observations and some more insights. Let me confess, that I do not have the esoteric expertise to review so profound a book of verse, but I can only say that when I finished reading the book, the ineffable beauty of these poems refused to leave me. Certain poems kept haunting me, and I know they will be forever etched in my mind. During the stage of semi wakefulness, or semi- sleep, there is an interplay of clarity and obscurity in the chambers of the mind, and when the nights are insomniac, this is heightened. There are silhouettes, misgivings, fears, demons, elusive scraps springing from some forgotten depths, inner conflicts, a certain anxiety, so palpable that it sends shivers up your spine, but sometimes even soothes you with the nocturnal music. With deft strokes, she takes the readers through a kaleidoscope, making us intuit certain things which are surfacing within her. The nocturnal smudges, and blurs soon assume an outline which she tries to fill with her words, trying to coax it into the foreground. ‘…………Decaying Nights’ is the section of Sheikha A’.s poems. Her poems throb with words such as ‘abysmal paths’, ‘icy vestibules’ , ‘alleyway of carnage’, ‘gothic entity’ [Olympus], ‘sterile but discarded gurney [adagio], sinking night, ‘congealed existentiality’, heirlooms morphing into decapitated limbs, ‘ephemeral epiphany’, ‘spider’s aging cobweb’, [Burnt] making you ponder deeply. And ponder some more. “…..there can be no other way to write out this congealed existentiality but with a thick ink of trite-full metaphors.” But believe me, there is nothing ‘trite’ about the metaphors that she so skillfully uses. The fevered imagination of the poets, enhanced by the dark of the night, gives rise to vivid dreamscapes and images, and they discern meaning in these silhouettes and shadows, tiptoeing about, until these images seep into the conscience and erupt forth as poems. Not wary of the dark, on the contrary, she loves the dark, and it is the darkness that spreads the light. ‘In Burnt’, she listens to the echoes breathing huskily in the emptiness, ‘shuffling its grime packed boots’, her hearing focused to decaying memories. The second section is called …….’of Love and madness’ and Suvojit Banerjee ‘ has a maddening urge’ to silently stalk nostalgia, following the trail, “from decaying jetties to swanky corporate buildings, picking up little breadcrumbs of memories and then giving them their due place in white and yellowed out papers’. His poems are allusive and liberally sprinkled with historical and mythological references. They throb with a palpable loneliness, love, loss and a yearning for the reclamation of a lost love. In ‘Day 382 : Another scamper through the city Street’, he paints a poignant word picture of loneliness in a metropolitan city, the painful futility of chasing mirages and tugging himself every night to find salvation, the lonely body pining for another . In ‘Painting depression in one afternoon’, the words are so evocative that they are forever engraved on the mind. I would also like to refer to another short poem of his [Un- required] which left me with a very palpable sense of loss. I kept going back to this poem, till I could almost feel a few pinpricks of the raindrops on my own skin, and also the pain of lost love. In ‘The Acceptable Madness’, he writes of his efforts at becoming accepted, and tries to ‘frame the utopia that rests on the fabled other side’. …….. In his poem “Invoke”, he says that “the moon carries scars like the ochre stains of blood on your wedding gown”. These above lines were some lines which I kept reading over and over again, so powerfully did they impact me. The poets have beautifully managed to complement each other. The metaphors are not at all trite or hackneyed but are distinct and deeply felt .One is mesmerized by the word-play, and the inherent lyricism of their poems, where we hear the trees rasping, hearts pumping and lone wolves howling. 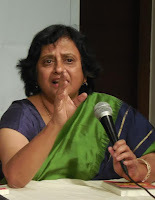 [Banerjee], we also feel ‘shapeshifting subversive fantasies’, ‘corroded cenotaphs of phosphorous remains’ and gasp as the, ‘walls huddle in obeisance’ [Sheikha A.] The two poets are like a ballerina and her partner giving a bewitching performance with their fluid moves, lifting, balancing and pirouetting for an absolutely awe- struck audience. Sheikha A. draws her imagery from the natural world, talking of chrysalis, rose petals, ‘moody breezes’, leaves, ‘newly sprung twigs’, and ‘fronds fallen by the river’ [Earnest] Suvojit feels comfortable talking of nebulae and stardust and invoking mythology and history; he uses the imagery of Pompeii and Vesuvius [Ignis Urit Semper] to talk of the intensity of the pain of his lovelorn heart. good hope, and the nebulae be memories of us. Between the three of them- two poets and one artist- they have managed to produce a beautiful, aesthetically appealing book, so tantalizing, that you want to go back to it again and again. Nights can inspire dark thoughts, despairing too, but herein, we find no depressing thoughts; the poems in this delectable collection only prod and nudge us towards self- introspection. Even when they are using dark and gothic metaphors, one can imagine them glowing inwardly as they flow beautifully with their thoughts and words, and take us along with them on their meandering alleys of the night. Nyctophilia does that to many writers. This is a book highly recommended for lovers of good poetry and a book to be read and re- read for the rich literary fare it offers. Suvojit Banerjee is from India and the United States. His works have been published in many Indian and International journals and magazines and featured in several anthologies. He currently works in a software company, and has worked as a lead writer/reviewer for a technology website. He observes, sometimes giving up consciousness in return. It is a dangerous thing, this silent stalking of nostalgia, but he has a maddening urge. He follows the trail, from decaying jetties to swanky corporate buildings, picking up little breadcrumbs of memories and then giving them their due place in white and yellowed out papers. He continues to juggle between poetry and prose, not deciding on where his heart lies. May be it lies in both of them, may be in none. Sheikha A. is from Pakistan and United Arab Emirates, Her works have been published by a variety of literary venues, both print and online, including several anthologies by different presses. Recent publications have been in Mobius, Abyss and Apex, Vita Brevis, Red Wolf Journal, Pedestal Magazine among others.